Alison Iovino (l) is visited by Gift of Life's Chairman Bill Begal (r) during her stem cell donation. Gift of Life Marrow Registry achieved a major milestone on June 27, 2016, facilitating its 3000th transplant – a peripheral blood stem cell donation made by Alison Iovino, for a woman battling Acute Myelogenous Leukemia (AML). The news that she was donor match came as a complete shock. Alison had to listen to the voicemail message three times for it to sink in. She had been told when she swabbed in 2013 at a Gift of Life drive at University of Maryland that becoming a match was a rare event, so she did not expect it to happen to her. The opportunity to donate came at the perfect moment in Alison’s life. The 23-year-old Maryland graduate had just made the decision to retire from her role as a Baltimore Ravens cheerleader to pursue a career as an educator. With no rigorous training schedule to follow, the timing for her donation could not have been better. By coincidence, the two-year-old grandchild of her mother’s friend was also suffering from leukemia, and had received a bone marrow transplant from his five-year-old sister. “It was so strange that my mother had just told me about his sister doing this, and then I got the call from Gift of Life. This was a big factor in making my decision – what if it was my sister or my mom who was sick?” Sadly, the little boy passed away the week before Alison went to her physical to prepare for her donation. However, the importance of having a stranger, such as herself, step in and help save a life could not have been clearer to her. To prepare for the donation she had several doses of Neupogen® to stimulate extra stem cells to develop, and while this made her a bit sleepy for a few days, Alison said she did not sleep at all the night before donation day. “I was thinking about my first letter to my recipient and how I wanted to share what this has meant to me – being a donor has changed me so much,” she said. “Even though I knew right away I was going to do this, it turned out to be so much bigger than I had imagined.” Alison felt fully recovered by the following evening, and said she would absolutely donate again if called for another match. Alison works as a substitute teacher, and in 2017 will relocate to New York to pursue a teaching certification. In her free time, she enjoys spending time with her family at their beach cabin. 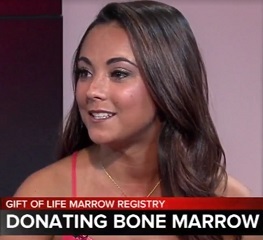 Alison was interviewed on WMAR ABC News in Maryland on August 11, 2016, speaking about her experience as a bone marrow donor and talking about how gratifying it was for her to help someone in need. To watch the video, click here.